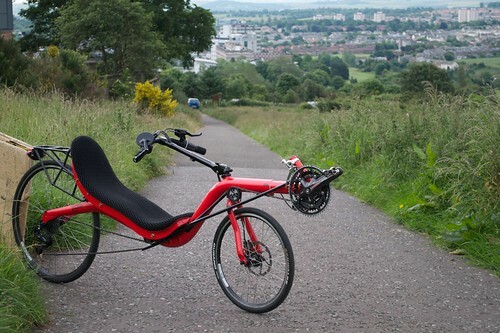 It’s probably fair to say that the Challenge Fujin is the archetypal lowracer, so I was very pleased to get this red SL-spec from Laid-Back-Bikes out on the roads of central Scotland. Although the light rack provided is quite capable of supporting a day bag I restricted myself to a shorter, all-out blast rather than the multi-day tour of the excellent Furai 24″. I’ll talk a little more about the bike’s versatility below. However good the Fujin lowracer looks however, it rides even better – I can’t think of a fast bike with such predictable handling. 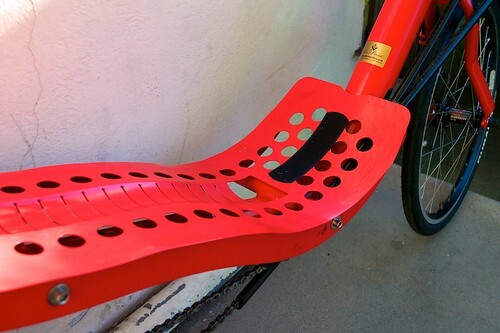 Aside from the reclined seat (which is essential, but may pose difficulties for the less experienced) there are really no catches here – you can corner with one finger on the bars, and no amount of lunging at the pedals caused the bike to skip or squirm. Thin tyres and a rigid frame definitely let you feel the road, but I’m not sure I’d want to compromise speed by fitting anything too heavy – Kojaks might be a happy medium if you’re likely to be riding in less auspicious areas. This bike really springs to life when you put pressure on the pedals too – it lives up to both its price and reputation. Carving into corners and rolling almost effortlessly above 20mph, I was strongly reminded why I came to love recumbents in the first place. For a glorious finale, I tailed a moped into work at 25-30mph. The rider could hardly believe it judging from their face in the mirrors, and neither could the grumpy taxi driver behind (no space to pass the moped, so he had to sit behind us both). Wonderful! The Challenge Fujin is not the most adjustable bike on the market, with a choice between 23 and 26 degree seating and… that’s pretty much that. You can’t even get different sized seats, which means that if you’re at either extreme you might be right out of luck without some adaptation from your friendly Challenge dealer. I find the SL seat to be slightly too short for me, but could mitigate it by cutting a notch out of a Ventisit pad to accommodate my uppermost vertebrae if I owned one. Leg length adjustment comes from a standard boom arrangement. I didn’t have any trouble with slippage even though I’d been advised to go easy on the tightening bolts. As I mentioned in the intro, the Fujin lowracer has a rigid frame and will typically sport narrow slick tyres. There’s no question that you feel the road through this arrangement, although I’ve also been on things with a much rougher ride (for instance, it’s much softer than the ICE Vortex trike). There is limited scope for wider tyres and mudguards – this bike had neither, but the frame and fork have standard mudguard fittings and you’ll certainly get away with something like a 35mm Kojak. While you can in practice mount racks or tailboxes to SLII (carbon) seats, the aluminium SL seat comes ready-equipped with a light day rack and this is one of the main factors differentiating the Fujin SL and the SLII. In the case of the SL you can easily fit a rack-top bag or a small pannier bag to either side, or fit larger side-panniers without worrying about the drivetrain or paintwork (which were minor issues on the Furai 24″). I wouldn’t recommend the Fujin if touring is your priority; but it certainly has the capacity for long day rides, commutes or brevets (where, for many, it excels). Another differentiating point between the SL and SLII is the presence of the disc-ready aluminium fork. At a modest cost in weight the Avid BB7 provides fantastic stopping power and modulation on the all-important front wheel (the stock rim brake is more than adequate at the rear). 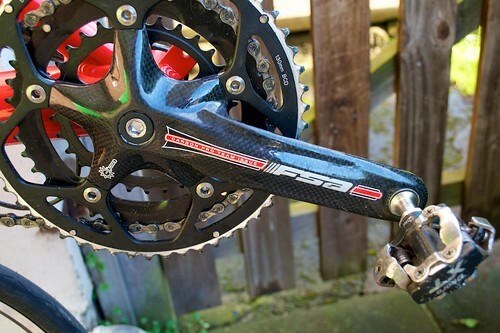 This Fujin came with a lovely-looking carbon triple chainset, of which I completely failed to need the granny ring – this does allow either a very low climbing gear or the use of a close-spaced road cassette retaining a relatively normal gear range. 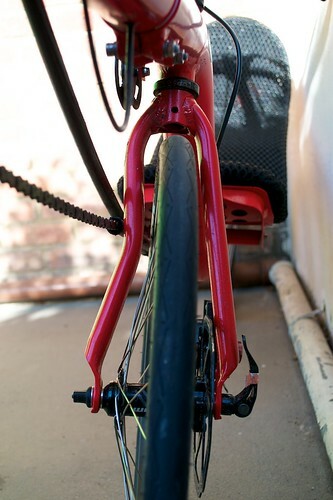 A strong rider could certainly consider a compact or full-size double, but the weight penalty of a triple is modest (a small ring weighs about 40g, although there are other additions) so the main judgement call comes down to the shifting performance – which, on this bike, was just fine. 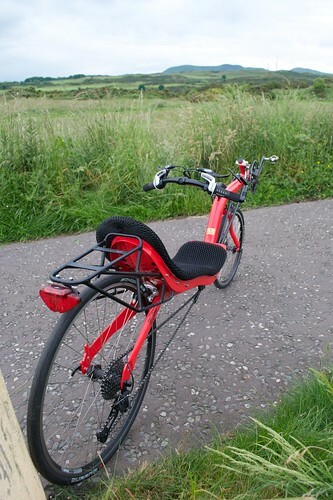 The photos above and below illustrate the asymmetric Challenge fork which provides added clearance for the chain, particularly if ‘dropped’ (not using the return idler, as shown). I didn’t ride this way because the chain length / routing needs to be adjusted, but it is commonly done with only a small caveat as regards to turning performance. With the chain lifted, the Fujin can turn very sharply. You may or may not get on with the non-retained return idler (there’s no bracket or other mechanism to prevent the chain derailing from the idler). When this was brought up on my Furai review, I heard that Challenge ultimately went this way due to consumer demand, so who am I to argue? The same articulated stem and handlebar combination were fitted to the Fujin as to the Furai I reviewed previously; again I found this to be a nice unit (the adjust is there when you want it and you don’t notice otherwise) although weight could be saved by fitting a rigid stem, maybe you’re heading for SLII territory there! Both shifting and braking were crisp on this bike and the cable routing (internally on the stem and frame) is still a welcome touch of class. 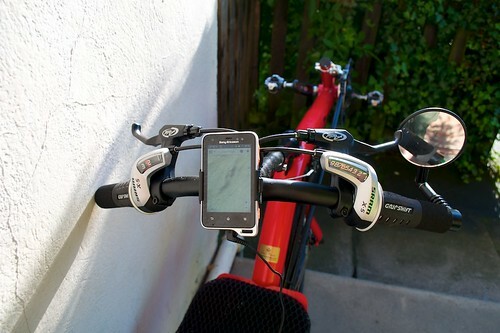 You can see my Sony Xperia Active fitted to the handlebars (music, GPS and Ant+ sensors, ET call home, the works) – so there’s no shortage of real estate. Lights would be better fitted to the boom and the usual tab is present to allow this. 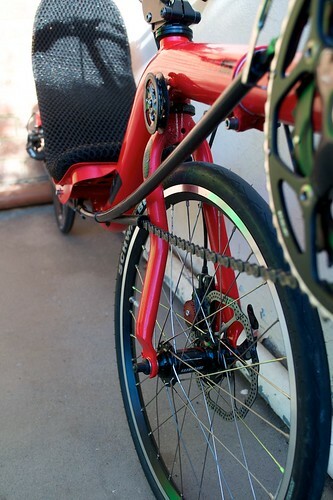 The Fujin comes with a nice set of Velocity Aerohead rims laced conventionally – no low spoke counts here. This means no worries over short component life or pothole damage too, of course! Initially I was disappointed by the idea of a 26″ and not 700C rear wheel, but nowadays it’s possible to fit a Schwalbe Ultremo racing tyre to a 26″ racing wheel, so it’s not quite as bad as you’d think. 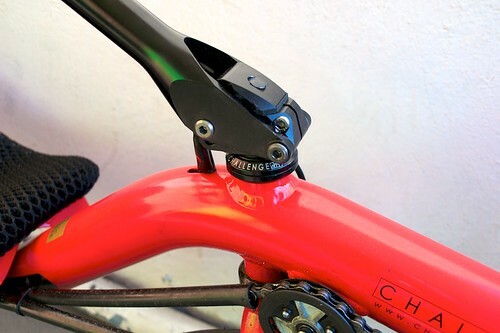 The main disadvantage is not being able to pick up off-the-shelf DF racing components. 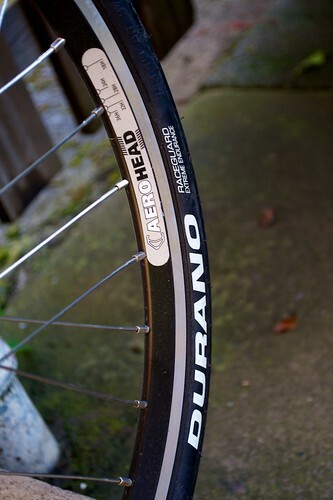 Even fitted with Duranos (which are only sort-of fast, compared with Ultremos, but offer quite a lot more cushioning) the bike spun up to speed and rolled along beautifully. I find this rollover interesting because it highlights the similarities between the Fuego (not generally considered an all-out fast bike) and the Fujin (which is). The seat angle is only slightly more reclined, and slightly lower, and while important neither of these is likely to make an overwhelming difference to the aerodynamics. The higher BB-seat delta is likely to help with power production and shielding the body behind the legs, of course. Personally though I think the main difference in performance derives from the stiff rigid frame – the weight difference not mattering much except on steep climbs. The Fujin definitely feels like the more refined performer of the two even at less than maximum effort – while the Fuego handles dependably, the Fujin delivers like its race-derived lineage promises it should. For day-to-day urban riding I’d say the Fuego has to win it (you won’t need to worry about bad surfaces and the whole bike is more dependable) but the Fujin may steal your desire regardless. As the rollover shows, there’s very little indeed between these two bikes, and in reality there’s not much between their performance either. The RaptoBike feels stiffer but then again, it is diverting the power side of the chain through 110 degrees (effect undocumented, but certainly lab-measurable). The Fujin SL is lighter and feels more significantly more nimble. The level of refinement you get in the Challenge bike is also undeniably a step above the RaptoBike – but I wouldn’t be surprised to hear that the Fujin’s lifespan under heavy use is also shorter. 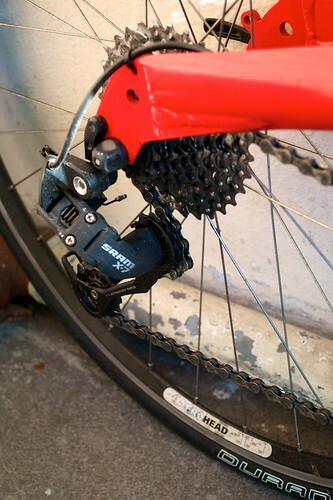 The RaptoBike is cheaper, but you do have a couple of special considerations such as “RaptoBite” and the workarounds inherent to a 20″ drivewheel. 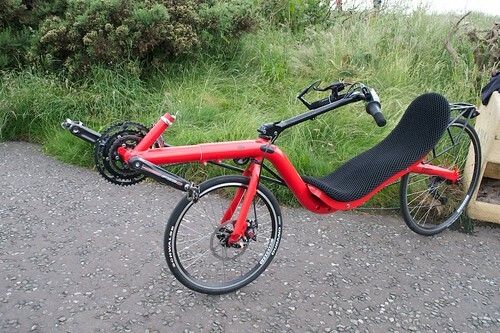 Definitely two bikes you’d do well to demo side-by-side, I think! These bikes serve completely different purposes, so this comparison is more for your interest than out of any sense of choosing between them (I hope!). The Furai has a comfortable touring outlook and is suspended, the bottom bracket also being slightly (1cm) lower relative to the seat -an effect that is increased by the more upright angle. The Fujin is significantly quicker than the Furai, but much less versatile. I wouldn’t like to try unpaved touring on the Fujin SL! Rolling on the open road, at the lower speeds typical of long-distance racing or brevets, the 700C wheels on the Corsa have a definite advantage. In contrast, the far superior aerodynamics of the lowracer will prevail at top speeds or when a low ride height shields you behind walls and hedges – in these conditions the Fujin SL will dominate. 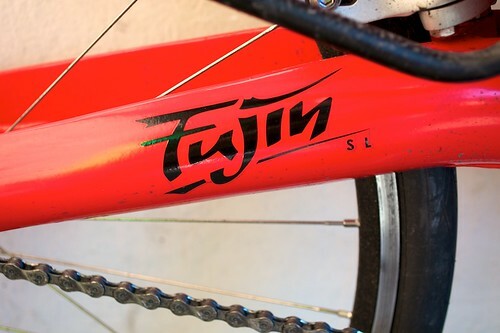 The Fujin’s also by far the more exciting bike to ride, in my opinion, and gives up nothing in chainline efficiency / directness either (see the “Euro vs stick bike chainline” article). With a bike as renowned (or hyped!) as the Challenge Fujin SL there was always the danger that I would feel underwhelmed, but I’m happy to say that isn’t the case. Challenge’s signature refinement, the lightness and responsiveness of the bike combined with the stellar handling make this a really compelling package – possibly the sweet spot out of all the lowracers I’ve tried, avoiding the expense of the VeloKraft VKII but noticeably more capable than the cheaper Raptobike. Crucially, the day rack makes it practical for commuting, long day rides / credit card touring and brevets. There’s no doubt about it, despite any little niggles this bike is an outright winner, and should absolutely be on your checklist if you’re in the market for a lowracer with street manners. Some have used a Fujin SL (a custom mix between components from an SL I, SL II, and yet other parts) to cycle rather long distances. It can be done. The site is in Dutch, but the PDF is available in English. Maarten was quicker than me on this one. Indeed the Fujin SL can be used for extensive touring, as long as one respects the weight limit. 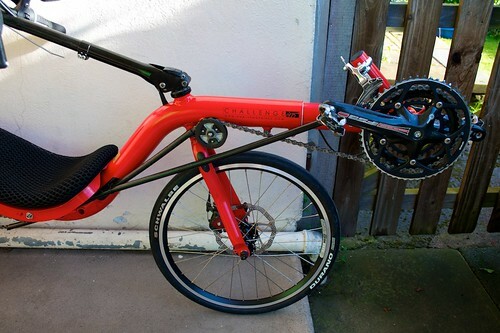 But a bicycle as light as this one, should be used with equally lightweight equipment so this should not be a problem. Riding on gravel roads is indeed not the purpose of this bike, but with 35 mm Kojaks it is doable. You are right the handling is superb. You really have to feel it by yourself to understand how well-balanced it is. The Fujin SL is a lovely bike. Very fast and responsive. I did have some challenges with the chain line and idlers. 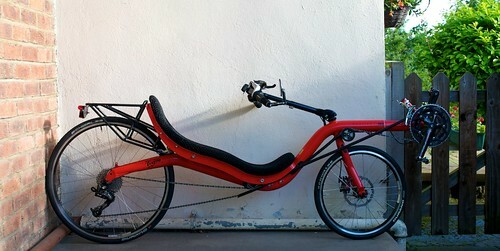 Now resolved with after market fit from Terracycles and some ingenuity from The Bicycle Works. Laid Back Bikes, as always, also very helpful. The rack is useful with a racktop bag which also doubles as a headrest. It is not a bike for your daily commute but long or short fast rides it is immense fun. I upped my average speed by 1mph on my usual loop. it definitely keeps momentum speed for longer than my previous Fuego. 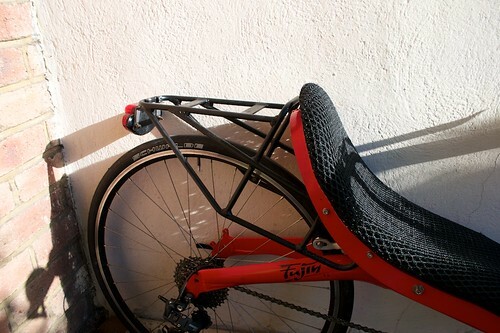 However Fuego is certainly more town user friendly and comfortable with its suspension and steel frame.